Market Square has served as Houston’s business hub since its beginnings in 1836. Woodbranch Investments continues to respect its great importance to the city, as they sought to create a monumental building making a fresh masonry statement in the skyline. Above the grand entrance of elegant cast stone surrounding the building, cladding 40 stories is oversize burnished architectural concrete masonry units to resemble stately limestone. Exactly. The exposed natural limestone aggregate catches the sun giving this block a true glimmer. Every CEO has something he enjoys doing, that enables him to relax and unwind. My relaxing moments are out on the ranch with our cattle. One afternoon while relaxing, I received a phone call from area code 281. 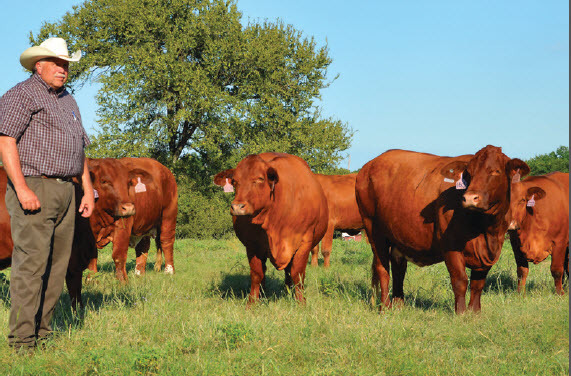 Standing in the pasture where we keep the young bulls, I was expecting a phone call from area code 281 concerning the purchase of one of our bulls. I answered. But this call had nothing to do with bulls. It was Tim Sommer, senior project manager with Harvey Builders, asking me to consider bidding a high-rise residential project in downtown Houston. I quickly told him we we had no manpower in Houston. He informed me that he called because we were referred to him by their Austin TX office. We had just completed the 36-story high-rise 311 Bowie luxury apartment building in Austin with Harvey Builders. They were pleased with this project and how it finished as scheduled. But Houston was nearly 200 miles from our office in Waco and we had no manpower in Houston. That was a 3½ hour drive one way. No one wants to add a 7-hour drive to their work day, nor leave their family for a long term commitment. I mentioned the call to our folks and they quickly gave the same answer. 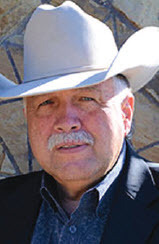 Two days later I was in the same bull pasture when Tim Sommer called again. This time he stated a little stronger that they really wanted us to bid the project. Even though DE Harvey was a premier contractor who we certainly enjoyed working with in Austin, we simply had no manpower to send that far. My answer once again was No. It was then that he informed me that this building was 42 stories and most likely it would be either stone, burnished block or a combination and it will start at street level and go all the way to the top. I must say he shook me, but I stood by my answer. The next morning I again shared with our folks and they agreed. The very next afternoon I had ridden over to the ranch. The last pasture was the bull pasture. The minute I drove in, my phone rang. Yes, it was persistent Tim Sommer. This time he said “I am sending you plans and I want you to price this”. The next morning, plans arrived and our folks could not believe it when I said, “Give them a price”. I also knew I had to talk to our field to see what we could do. Once our field people saw the scope of this job, they were committed. We all knew this was a building type where Brazos excelled. This would be an opportunity to work with this distinguished architect with a vision to redefine Houston’s skyline with exquisite concrete masonry. An opportunity to work with the new oversize CMU burnished to expose limestone aggregate. 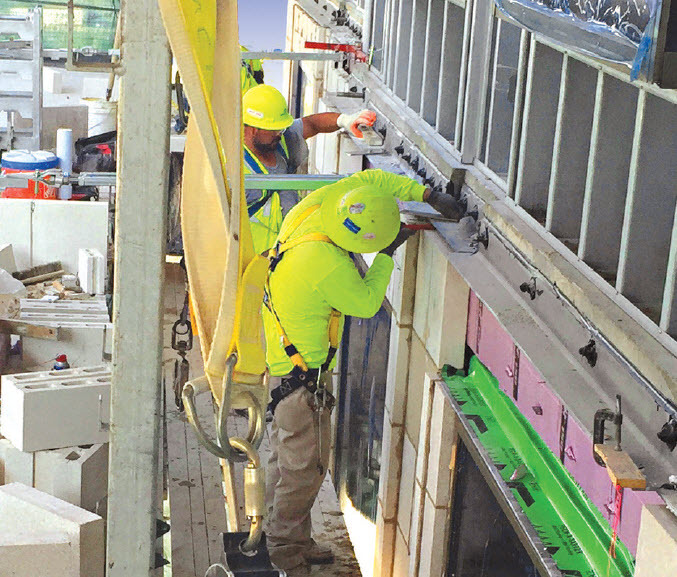 A new application for cost-effective concrete masonry. After bidding the project, they just couldn’t help feel deep down that they would love to do this job. We knew that we had a superintendent who could handle this project. But that would require relocation. We were very excited when Harvey Builders asked us to come down and meet with them and the architect to discuss the project. It was a pleasure just to have the opportunity to be at this table. After leaving, we felt very good about our chances of winning the job. They liked how we pushed the schedule, a system developed from constructing quite a number of high-rise buildings in recent years. We shared the same safety goals. We were able to answer all of their questions. Our biggest challenge would be manpower. A month later, I was in Gatlinburg TN on a family vacation riding up to the top of the mountain on a chair lift. My phone rang. It was Sommer. This time, a short conversation, but I heard these words, “We are awarding the Market Square project to you.” It was neat that I was on my way to the top of the mountain and I now knew we were going to the top of 42 stories with elegant MASONRY! After careful review of this project, Superintendent Roger Lopez, who had just finished the highrise in Austin, and his two loyal crews of about 30 men agreed to move their families to Houston to embark on this skyscraper that would become the tallest CMU building in Texas. They liked living and working in Houston so much that they have stayed. Brazos Masonry now has dedicated manpower in Houston! My other thought was how blessed we were to be cladding with more than 100,000 4x16x24 burnished block up 42 floors in downtown Houston. This was a new journey and I could hardly wait to reach our destination: Floor 42. Jackson & Ryan Architects design intent was to reference the turn of the 19th/20th century urban residential towers in cities like New York and Chicago. Masonry was chosen because of its historical references and to contrast with glass and steel office buildings downtown. Masonry helped identify the tower as a residential property because of its traditional associations. Ground level masonry required a higher level of detailing because of the immediacy to the pedestrian and to provide a more formal experience for the residents. Cast stone and natural granite were used at the base due to the ability to customize sizes, shapes and profiles that are not available in the burnished block. Inside the building, strength and durability of nearly 50,000 commodity raw grey CMU surrounds the energy vault, mechanical and electrical rooms to protect them. Burnished block was a most economical and efficient product to use at the upper floors where work was repetitive. In addition burnished block proved to be an outstanding product for this scope due to its pigmented color consistency and water/stain resistances. According to Eric Graves, vice president sales at Boral Concrete Products, Houston, “Guy Jackson, principal of Jackson & Ryan Architects, approached us with a can you doquestion. As Jackson began designing Market Square, with a 40-story residential tower and an Art Deco look from the 1930s, he discussed the possibility of developing an oversize product mimicking limestone. The oversize 16 x 24 veneer could be a very cost effective solution, and very handsome. Typical floor wall section: Masonry coursed on an 8" module to minimize cuts. Each masonry profile is labeled and keyed to match manufacture's standard module. The CMU was quoted with and without chamfered cuts. The straight edge was chosen for its more modern look. This CMU does not look like the raw grey 8x8x16 unit that we have all grown to rely on for its strength, durability and performance capabilities. This oversize CMU allows architects a very new impressive product to design with for those who like to think and design out-of-thebox but with established confidence. Graves says this is a distinctive win for the owners, a compelling win for the architect, a cost effective win for the block producer and a win for the mason who appreciates this precise product to work with. Jackson and project manager Julian Pittman, AIA, principal, modeled the design in 3D. They also used 3D modeling in a limited manner as a construction documentation tool. Drawing stone and block in elevation, they provided profile drawings of each block and noted the sections where each profile was used. The entire project exterior was based on an 8" masonry module both horizontally and vertically. In the office, this allows a visual check to minimize dimension errors. In the field, cutting masonry is minimized expediting construction productivity. Jackson and Pittman did an outstanding job understanding dimensioning. Looking at the building, one won’t notice many cuts or large joints to make dimensions work. The goal was to make the building look as if the skin was stone all the way to the top. CMU was laid on half bond. Sizes used were 4x4x24, 4x8x24, 4x12x24 and 4x16x24 to minimize cuts and waste. It was a bit like putting together a puzzle. Jackson and Pittman paid particular attention to window heights, door height and corner heights. Mission accomplished. Harvey Builders understood this type of project and they also knew history was being made using this product. It was the first time this oversize CMU had been used for this high rise veneer application in Texas. Anchors CMU was anchored every 16" horizontally and vertically using the H-B 213 seismic adjustable veneer anchor, designed to withstand over 200-lbf, in tension and compression. Stainless steel was selected to resist rust from any moisture. Houston is located in tornado alley as well as a hurricane risk area where secure connections are code. Horizontal wire reinforcing is used as well as vertical behind the units. Hydraulic mast climbing scaffolding that wraps the tower is shared by several trades including dry wall contractors, waterproofing contactors, masons, and masonry cleaners who begin at the top cleaning their way down. As well as window installers. This keeps all contractors to a tight schedule for greatest productivity. Lower scaffolding was more suited for cast stone installation. We found Downtown Houston to be very congested with buildings, motor vehicles of every kind and pedestrians everywhere. Knowing how to maneuver and manage a tight site was imperative. As was pre-planning. Project Manager Kent Bounds shared that the schedule would call for construction of one tower floor per week on average. Scaffolding was hydraulically height adjusted continuously for ergonomic efficiency so bricklayers remain at peak performance throughout the duration of the job. Planning was detailed and complete. Our schedule was aggressive, but could be accomplished. Superintendent Lopez focused on making reality better than plan. His loyal guys gave him all they could. Crews began developing a rhythm right from the start. Once they settled in knowing the job, the repetitive floor plan allowed them to begin to work most efficiently. As project progressed, crews were able to lay a story in four days. The tower’s 42 stories were completed in about 42 weeks, including weather interruptions of high winds, rains, excessive hot weather. Noone can be on the scaffolding with winds of 35 mph. During the 15 months of this job weather delays were only encountered about 10-12 times. Hydraulic mast climbing scaffolding wrapped the building for greatest efficiency, productivity and safety. It was hydraulically height adjusted every couple courses for ergonomic efficiency so masons could remain at peak performance throughout this job. Hydro Mobile engineers study site, building requirements and weather to determine parameters for securing scaffolding’s stiff arm tie-in every two floors. Block deliveries were scheduled for 3:00 and 4:00 am as Houston slept to avoid further congestion, to keep the job moving and save material staging costs. We ordered for just-in-time delivery per floor and every floor was stocked in advance. Boral was spot on. They never missed a scheduled early morning delivery. Safety was of utmost importance. Hydro Mobile scaffold ensures safety with all its components built in so no parts are ever missing or out of place to become a fall hazard. Cast stone and granite clad the lower two floors. This makes a massive podium for the tower to rise up and reach toward the Texas sky. It should make the entire industry proud to drive into Houston and see this luxurious masonry tower as the newest addition to the skyline. Market Square leased three months earlier than expected projections. As the job progressed, I reflected on how close I was to not being a part of its success. So from the bull pasture to the 42nd floor of Market Square Tower was quite a journey. I knew this was going to be fun. A great team, including the architect, general contractor, masonry superintendent, craftsmen and support team made this journey one of complete satisfaction. We at Brazos had a strong team being led by president and project manager Kent Bounds, my son, and superintendent Roger Lopez. NCMA has turned 100 years old this year and it was as if we contributed a large birthday cake. One hundred years ago our forefathers of this industry were happy to make grey 8X8X16 block produced by hand in single molds, but today we have Market Square Tower made with oversize units resembling limestone manufactured in a state-of-the-art block plant with high tech equipment. There was a time when CMU were purchased for interior partition walls of schools and backup walls for their durability, fire compartmentation, noise isolation and low cost. Never were they intended to clad a show-stopper highrise in a major city skyline. 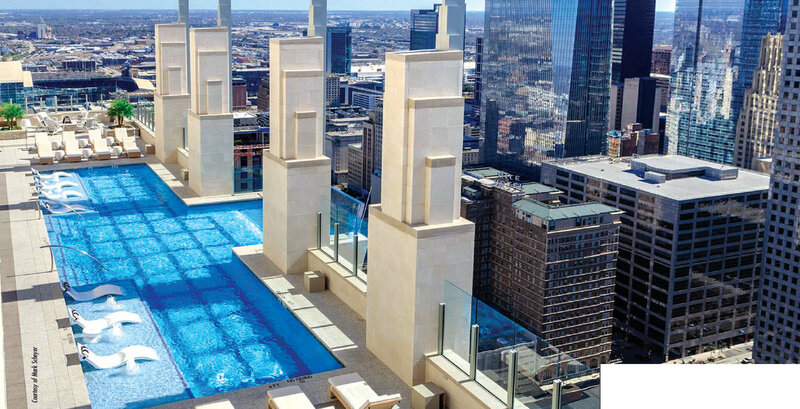 Even as the industry evolved to include pigmented split face block and colorful burnished CMU, no one ever thought it would be a reality to drive to downtown Houston, go up to the 40th floor and see oversize burnished block accenting a beautiful all-glass pool cantilevered from the edge. I remember when Bob Whisnant, one of my block suppliers, told me that they were introducing oversize burnished block. My question was “what market are you trying to get?” They first said elevator fronts and then maybe interior feature walls. It wasn’t long after that we did do a very large feature wall in a high school. That was about five years ago, but we never thought about setting a precedent of 42 floors. When you think of 100 years that is a century, and there have been many accomplishments that we can be proud of but Market Square Tower is among the crowning jewels. I wonder now, where will we go next. Obviously through research and visionaries, we know there are exciting days ahead. We see an architect take granite & cast stone and then asked the question: Can we put oversize burnished block as the skin above? Not only is the material affordable and high performance, but the appearance is pure elegance. It shines and glitters as the sun shines upon it. So, from this Design and Construction team including us at Brazos Masonry to NCMA, Happy Birthday to an industry that is still young and energetic! We are proud to have played such a significant role in producing this project.